Everything about the 2016 Chrysler 300 is better quality and more comfortable, and unique than anything on the market today. It offers the latest in technology and features a classically American style and feel to provide the ultimate experience in luxury, performance, and drivability. An excellent ride coupled with the available V8 engine means you won’t feel the bumps in the road but will certainly appreciate the enormous power under the hood of this luxury sedan. An intuitive touchscreen makes navigating the interface a breeze and available premium sound options provide a cabin that sounds more like a concert hall than a vehicle interior. Every 2016 Chrysler 300 exhibits the excellence and quality craftsmanship of American-made products and gives meaning to the philosophy of having pride in ownership. All of Tempe, AZ, Phoenix, AZ, Glendale, AZ, and Gilbert, AZ can discover the greatest in American design and engineering at Tempe Chrysler Jeep Dodge Ram. Come in today and test drive this 2016 Chrysler 300 for sale in Tempe, AZ to see what sets us apart from the competition. The 2016 Chrysler 300 has the unique characteristic of being a refined luxury vehicle distinguished with a cool and aggressive style. You won’t feel bad for driving this sedan and its strong upscale accents and appointments which include numerous upgrades and features. A rear-wheel drive provides more appeal in a primarily front-wheel drive market and the V8 provides the sound and feel of old-fashioned muscle that is expertly tamed in a premium vehicle package. Every 300 is quiet and smooth no matter what the conditions are like outside and handling is impressively solid. Rear bench seats provide more legroom than most others in its class while excellent cargo capacity is one among many in a long list of standard options. Bluetooth, automatic headlights, heated mirrors, rearview camera, keyless entry and ignition, leather upholstery, and an 8.4-inch touchscreen interface are just a few of the things that make this vehicle a must-see when it comes to the best value in full-sized luxury sedans. A base-trim 2016 Chrysler 300 comes equipped with a 3.6-liter V6 engine producing 292 horsepower and 260 lb-ft of torque. 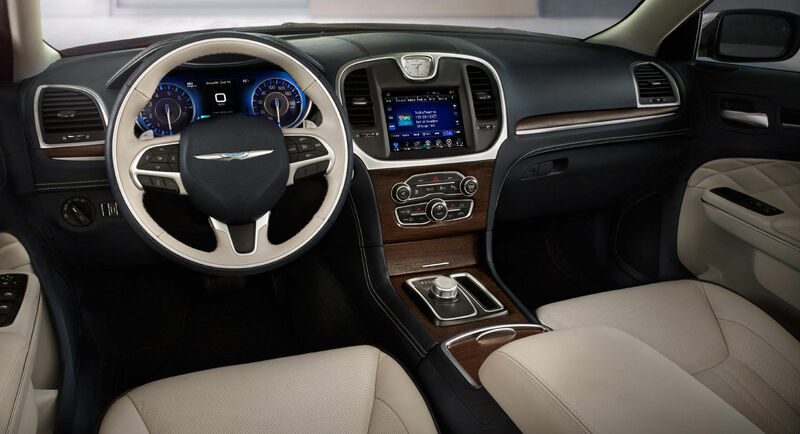 A rear-wheel, eight-speed automatic transmission is standard and delivers all the power and performance you expect from the performance of the Chrysler brand. There is also an available 5.7-liter V8 engine that puts out an incredible 363 horsepower and 394 lb-ft of torque, which is all the power you need and more. Contact us today here at Tempe Chrysler Jeep Dodge Ram in Tempe, AZ to learn more about this impressive vehicle, and how to get one in your driveway!